NOTE: Before installing the extension, you must remove all Harmony offline and database preferences. In the top-right corner of the Adobe Extension Manager, click on Install. In the Open dialog, browse to and select the Export to Harmony.zxp file, then click on Open. A message opens informing you that you're about to install the Export to Harmony extension. You may see the following message confirming that you want to install the extension. Click Install. In order for the changes to take effect, you must close and restart Adobe Flash. If open, close Adobe Flash. From the Products list, select Adobe Flash. If you have a previous version of the Export to Harmony.zxp extension installed, it will be listed in the right pane. A message opens asking you to confirm the removal of the extension. Adobe has stopped maintaining and updating their Extension Manager CC, therefore, it has become difficult to install extensions. In order to link an extension from Animate CC, follow the steps below. Download the ExManCmd from Adobe’s website. Put the ExManCmd_win folder in a safe place. NOTE: The ExManCmd_win folder must not be deleted; this folder is necessary for installing or updating .zxp files. 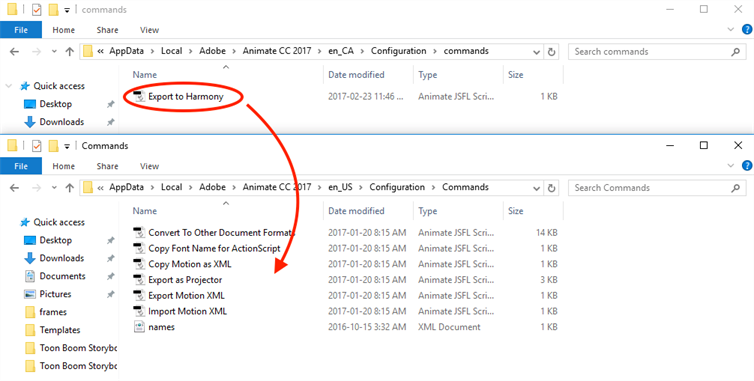 Move or copy the Export to Harmony.zxp file directly into the ExManCmd_win folder. In the ExManCmd_win folder, hold Shift and right-click to select Open command window here. If no error message displays, the extension has been installed on your computer and recognized by the Extension Manager CC. Access Top Menu > Commands. If the Export to Harmony option appears in the Top Menu > Commands list, your installation was successful. 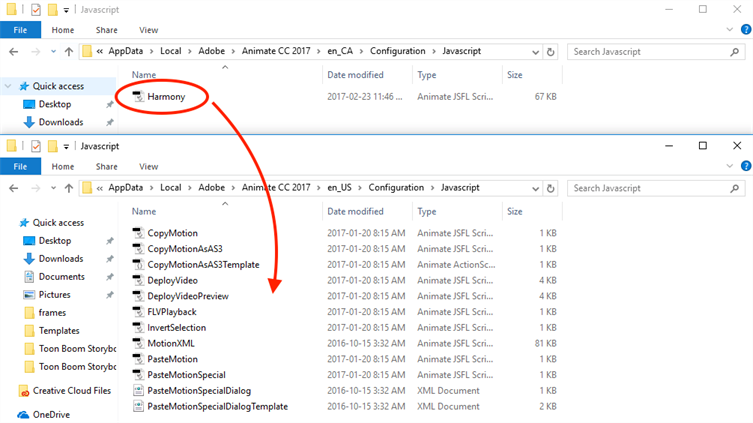 NOTE: If you have a region language other than English (US) installed on your computer, or if you have more than one language installed on your computer, Animate CC may not be able detect in which language folder the extension has been installed. If this occurs, you will not be able to see the Export to Harmony menu option in Top Menu > Commands list. To correct this, proceed to How to ensure Adobe detects extension files installed on your computer. If Adobe detects more than one language on your computer, you will see multiple language folders in the path. Look inside each folder to detect the main language used by Adobe on your computer. To do so, compare the contents of both folders. Copy and paste the contents of the commands folder within the sub-language folder, to the commands folder within the main language folder . 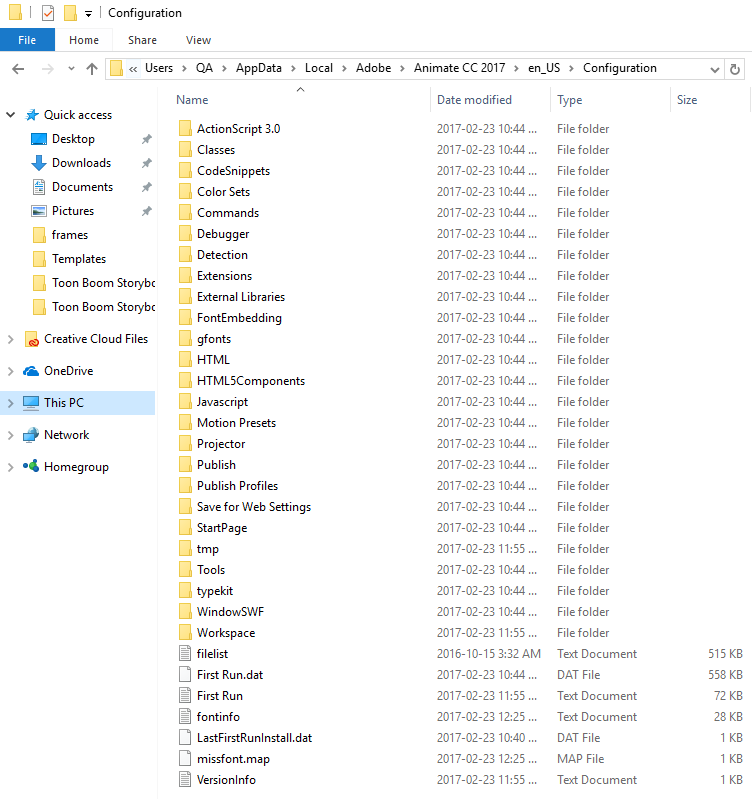 Copy and paste the contents of the WindowSWF folder within the sub-language folder, to the WindowSWF folder within the main language folder. Put the ExManCmd_mac folder in a safe place. NOTE: The ExManCmd_mac folder must not be deleted; this folder is necessary for installing or updating .zxp files. Drag and drop the .zxp file directly into the ExManCmd_mac folder. In Terminal, go to the folder where the ExManCmd_mac package was extracted.